A high-end laptop that offers a stylish all-aluminium design, lots of processing power, a generous selection of ports and a vibrant HiDPI screen for a reasonable price. Just don’t stray too far from a wall socket as the battery life barely lasts half a day’s work. The current king of high-end Linux laptops is the Dell XPS 13 (Kaby Lake) Developer Edition, but independent reseller System76 has launched its own lightweight laptop, the Galago Pro. Our review model has a base spec of an Intel Core i7-7500U processor running at 3.5GHz, 8GB of DDR4 RAM, 250GB M.2 SSD, Intel HD Graphics 620 and a lovely 13-inch HiDPI display – a similar spec to the Dell, albeit without the same level of ﬁnish. Galago Pro’s all-aluminium casing wouldn’t look out of place among more expensive laptops. It’s also impossible not to notice how light the Galago feels in the hand. However, when you ﬂip open the laptop, the thickness of the display’s bezel is a little jarring, especially if you’ve spent any time with Dell XPS 13’s inﬁnityEdge display. Still, the 3,200 x 1,800 HiDPI screen is clear and vibrant, and scales by using proper pixel doubling. While we found the Galago’s responsive chiclet keyboard a joy to use and the multi-touch touchpad precise, the US QWERTY keyboard layout does highlight System76’s US home market. Given that the keyboard has an excellent selection of function keys and an Ubuntu superkey, we didn’t ﬁnd the change difﬁcult to adapt to. However, we were surprised not to ﬁnd a UK charger in the box, as having to buy a chunky adaptor seems to defeat the point of owning such a lightweight machine. Our review model shipped with Ubuntu 17.04, but you can opt for 16.04 LTS instead (or Pop!_OS in October). Like Dell, System76 supplies its own driver and PPA repository, which ensures that all the components are supported out of the box for a solid Ubuntu desktop experience. 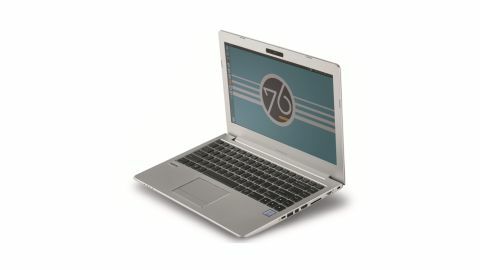 In a world of Ultrabooks starved of ports and overrun with dongles, the Galago Pro’s arsenal of ports is jaw-dropping. You can see the full list in the spec boxout, but it has both a Mini DisplayPort and an HDMI port for plugging into your desk monitor or making presentations. It also has three USBs and a low-proﬁle Ethernet port! The Galago Pro has much to offer, which is why it’s so bitterly disappointing to discuss battery life. Even in general use, writing and surﬁng the web, it lasted roughly three hours and 48 minutes. This isn’t enough for a normal working day, and the best we can say is it’s acceptable for the odd meeting out or trips to a coffee shop. Although an unfair comparison, the Dell XPS 13 (Kaby Lake), which cost at least £400 ($540) more when we reviewed it, lasted nine hours. In terms of graphics, the Galago Pro isn’t meant to be a gaming machine. Essentially, it’s on a par with the Dell XPS as they both use integrated Intel HD Graphics 620. For instance, in Open Arena, the open source clone of Quake III Arena, the Galago averaged 17 frames per second. The Galago only managed 243 points at 1080p in our OpenGL FurMark tests, whereas the Dell XPS 13 9360 achieved a respectable 473 points, but that’s likely down to the extra 8MB you get in Dell’s £1,508 ($2,025) model. Whether you think the Galago Pro and its battery life are good enough for you may boil down to the price. Our shipping manifest indicates our review model cost £1,057, but you can get the same spec on the website for $1,194 (or £915 plus shipping and taxes). In contrast, Dell sells its Full HD display (1,920 x 1,080) XPS 13 model starting at £1,199 ($1,610) and the QHD+ display (3,200 x 1,800) version for £1,499 ($2,010). In a number of signiﬁcant ways, the Galago Pro is limited by its partnership with Clevo, which dictates some of the component compromises System76 has had to make – the most damaging is the choice of battery. It also doesn’t have the unibody design of a MacBook or the tiny bezel of a Dell XPS 13, but then it is cheaper. When in full control of components, System76 offers a generous selection of ports that you just won’t see on more expensive laptops and a smooth, stable Linux experience that enhances Ubuntu where it’s needed. The Galago Pro offers so much at an excellent price and we’d desperately like to give it a higher score, but, ultimately, we can’t as the portable experience is hobbled by its battery life.